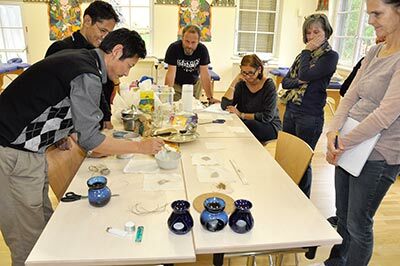 The Traditional Tibetan Mild Therapies taught in this course—”Jamche” (‘jam dpyad)—include massage therapy (‘Kunye,’ bsku mnye), compresses (dugs pa), hydrotherapy (lums), heat therapy (hor me), and cupping therapy (me bum), among others. These holistic practices are said to harmonize imbalances in the subtle energies that flow through the body (rlung), and promote health, wellness, and relaxation. After providing a theoretical overview & demonstration of these authentic Tibetan therapies, our Jamche-Kunye program focuses on practicing therapy methods in the group. We then organize practice sessions, where participants work with “volunteer clients” under the supervision of our teachers. Anyone is who has completed (or is currently participating in) our Fundamentals of Traditional Tibetan Medicine (or provides written documentation of an equivalent) is welcome to join! Your teachers will be traditional Tibetan Amchis, alongside other experienced and qualified teachers. The course is taught in English with German translation. Some theoretical classes are offered online; pre-recorded video or audio sessions will be made available in time to study before the practical classes. and ends on 12th – 16th November with the last module. Classes are offered during 3 – 4 day modules. For entering the exam students have to complete all modules and present documentation of 150 Jamche-Kunye sessions. After passing the exam students will receive an official certificate, jointly issued by Tibet Center Austria and Men-Tsee-Khang, Dharamsala, India.